Redwood's Medical Edge: What the Difference Between NICU and PICU? Within the last several months, I was having a conversation with a reviewer and he interchanged the words NICU and PICU several times and it became clear to me that he didn't really understand the difference between these two units so I thought I would clarify that here today. A NICU, aka Neonatal Intensive Care Unit, is specifically for babies who have just been born and are having difficulties. This includes premature babies (23-24 weeks is considered viable) up to normal gestational age of 40 weeks. This is their area of specialty. The problem becomes-- when can the babies go back to the NICU if they become sick? 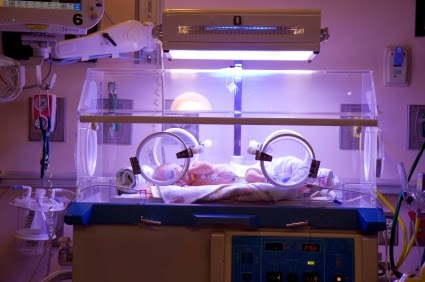 Often times, a NICU won't take a premature baby back once they've been discharged home for a couple of months (even if they are still an infant) because they could be "contaminated" with all sorts of other-worldly germs. So, if the infant is sick enough and needs an ICU admission they will likely (though not always) be admitted to the PICU. The PICU, aka Pediatric Intensive Care Unit, is for infants the NICU won't take and all other kids up to about the age of 18 (some up to 21) or whatever age the pediatric hospital has decided to admit. Even this age cut-off is becoming blurred because patients with chronic diseases (cystic fibrosis or special needs kids) might stick with their children's hospital well into their 20's. This is becoming an area of concern for pediatric institutions-- how to transition adults into adult-centered care. Another way an adult might end up in the Pediatric ICU is if they have had a repaired congenital heart defect. There really is a limited number of adult cardiac surgeons who are comfortable operating on adults with these defects. In all honestly, it's only been in the last couple of decades that these kids were living to adulthood but improved surgical techniques have changed all of that.